Where does your choir sing? Some churches have balconies where choir members sing from the back of the church while other churches put the choir front and center at the altar or in ranks along the sides of the sanctuary. Some churches have the choir stand in their pews and others bring the choir out onto the dais for special music and then have them return to a section of pews in front of the congregation. Wherever you put your singers, you’re bound to need pews. You’ll notice in the image above that there are two church pews installed behind the pulpit. 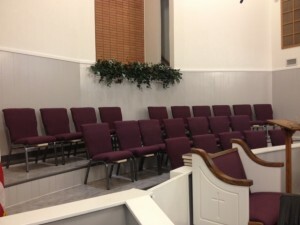 Instead of clergy chairs, these church pews we installed are perfect for multipurpose use by both the clergy and a choir if the need arises. With the piano at the front of this church, a lot of the focus of the church’s layout is on music. Other churches need more space for a choir at the front of the church and don’t want to opt for church pews. We fitted these church choir chairs with the same fabric we used on the pews in the church. While this is a typical option, be sure that you consider what happens when your choir fluctuates in size and what you’ll do to fit everyone in. Church pews allow people to squeeze in together in the space required when necessary, which you can’t always do if you don’t have enough chairs for a growing choir. We also made a small individual pew for this church, visible in the photo above behind the pulpit. 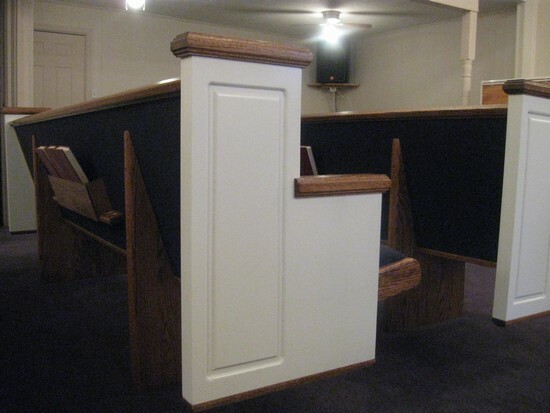 Since we build custom church furniture we can build church pews to almost any length you need, including small church pews like this one. Everyone in the congregation may stand and sit during worship, but choirs usually spend more time standing, and they usually also hold music while they do so. Chances are you have children in the midst of your congregation, but perhaps not in the choir. Also, if your choir is robed, there will be a few extra inches required for the robes and stoles worn over ordinary clothing. All these factors can mean that fewer people will fit in a choir pew than in the pews in the main part of the sanctuary. Consider this when planning space. Choirs usually stand in specific groupings based on the part they’re singing: the tenors stand together, the altos stand together, etc. Some churches don’t mind having a tall soprano nip up to stand with the basses if the soprano row is crowded, but others won’t hear of it. This means that there is less flexibility in the use of space. If your choir processes, be aware of the way they enter and leave the choir loft and make sure that there is enough open space. Do you have visiting choirs? Do you invite everyone up to sing the “Hallelujah Chorus” on Christmas and Easter? Do you bring the Youth Choir in on certain Sundays? It’s easy to forget these occasional needs when planning the choir seating. We’ll be happy to help you figure out how to accommodate your choir. 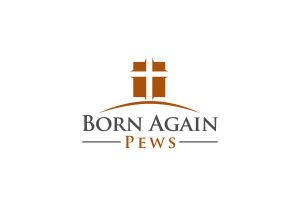 We offer free quotes for all our projects so be sure to request one to see how your church can work with Born Again Pews.